Games are fun. Exercise can be boring. But what if you could play and train at the same time? COMPUTER GAMES AND TRAINING: Why do gym workouts have to be so insufferably boring? At least they seem that way when you walk by and peer through those big fitness studio windows. Some of us would rather sit down for a computer game, but at the same time we know we should be getting more exercise. But lucky for everyone, some talented people are working to bring these two things together. Soon you’ll be able to get your adrenaline rush as you drive a tank around and compete with friends and strangers, all the while working out and enjoying a good laugh together. “People say they didn’t even notice they were exercising after they tried the game,” Kristoffer Hagen says convincingly. Hagen hatched the idea of ​​a game that would combine tanks, big weapons and challenging tricks. That in itself sounds promising, but the Pedal Tanks game also requires that you take a few rounds on your training bike. Hagen is a PhD candidate in NTNU’s Department of Computer Science. He is also a full-on computer gamer and seems to be physically fit. That’s probably partly because he plays volleyball, but occasionally he feels compelled to do other workouts, too. “I was sitting with a friend and playing computer games when he suggested we go work out at the gym,” says Hagen. They both did, albeit reluctantly. But heading out in the winter darkness, they began to talk about how much better it would be to be sitting at home and playing. Then and there Hagen had the brainstorm to combine games and training. That thought became a master’s degree, and later a doctoral project. But the fun is always in the inventing. Pedal Tanks is played in teams of two and is based on the familiar Capture the Flag game, where each team has a flag to defend while trying to capture the other team’s flag and bring it back to its home base. We decided we had to test it out. Hagen just blew up the tank that this Gemini writer was sitting in. I have no excuses, other than that he’s a lot younger, in better shape – and actually created the game and has been practising. Still, it’s annoying. And that’s exactly one of the points of the game. A lot of exergames try to get you to work out, but few of them are very motivating. Usually, you don’t really care if you win or lose, because they haven’t been created by players who know what will engage us. This game is different. In Pedal Tanks you have to move to get more ammunition and access to tricks. Cooperation is absolutely essential. You also have lots of different tanks to choose from, each with its own special features that augment other tank types. In short, it’s a real shoot-em-up game. The controls are designed so that they can be used with several types of exercise bikes. This is important to make the game as broadly accessible as possible. Hagen presented a prototype of his exergame at Norway’s Researchers’ Grand Prix. This is a competition where doctoral candidates compete to be the best research communicator of the year. You may be able to try Hagen’s game for yourself before too long. You might also like: Computer games – the key to managing IT restructuring? “I’ll never get to the point where I think we’re done developing the game, but we’ll arrive at a place where it’s done enough to offer to others. We have a working prototype that’s being used daily by engaged pilot users at 3T gyms and Frøya high school,” says Hagen. He is also behind the company Playpulse, who will be developing and marketing the game. Hagen needed to speed things up, so now five people are involved. For the time being. People who have seen the game or read about it have given good feedback. That’s what Hagen’s team needs and wants. At some point, Hagen wants to offer the game privately as well, but initially gyms and various health initiatives are the target groups. Playpulse is being supported by the Research Council of Norway and NTNU Technology Transfer to accomplish this goal. It’s a good start. What needs to happen to entice more seniors up and out of their easy chairs? The Generation 100 study found some answers by combing through 70 000 exercise logs. Boys and young men who are obsessed with building muscle have more mental health issues than researchers and healthcare professionals have previously recognized. Does weather influence older adults’ physical activity? The summer of 2018 has been one of the hottest and driest in recent times in large parts of Norway and Europe. How does weather affect the exercise habits of the elderly? 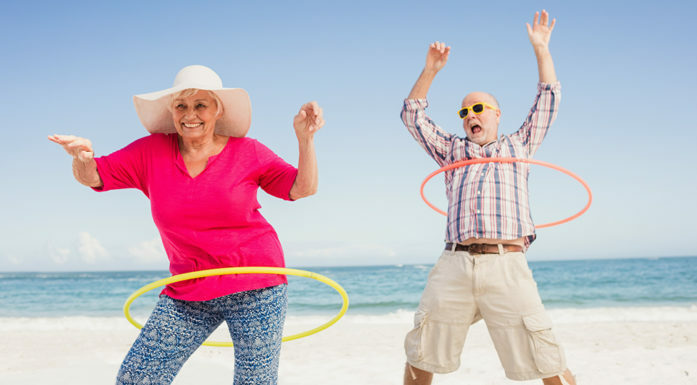 A study of 1200 older adults’ activity level linked to weather data shows that warmer, dry weather is the most inviting.